The gunman blamed for twin attacks in Norway that killed 93 people targeted a political island retreat that had invited many immigrants to participate. The man blamed for twin attacks in Norway that killed 93 people and wounded nearly 100 said he was motivated by a desire to bring about a revolution in Norwegian society, his lawyer said Sunday. Anders Behring Breivik, 32, has "not denied" the accusations against him and will explain himself in court on Monday, according to his lawyer, Gerr Lippestad. "He thought it was gruesome having to commit these acts, but in his head they were necessary," Lippestad said, adding his client denies criminal responsibility for Friday's attacks. "He wanted a change in society and, from his perspective, he needed to force through a revolution," the lawyer told Norway's public broadcaster NRK. "He wished to attack society and the structure of society." Norwegian authorities also reported another death in Friday's mass shooting at Utoeya Island near Oslo, bringing the total killed at the island youth retreat for members of the left-leaning, ruling Labour Party to 86. Seven people were killed in a car bombing earlier Friday on Norway's government headquarters in Oslo. Hussein Kazemi, 19, sought asylum in Norway two years ago. The Afghan refugee has bullet wounds in both legs and an arm from the attack on the island. Kazemi said the shooting began soon after he finished playing soccer with fellow party activists from Afghanistan, Georgia, the Kurdish regions of Turkey and Iraq, Sri Lanka, Somalia, Lebanon and other countries. The teen said he doesn't consider Norway a hostile place for people like him. "You have only one life and you must take the good with the bad," he said from his hospital bed on Sunday. Meanwhile, the chief surgeon at a separate hospital treating 16 victims of the camp massacre revealed Sunday that the killer used special bullets designed to disintegrate inside the body and cause maximum internal damage. P.O.V. :Should the Norway gunman's court appearance be open to the media? Commonly used in hunting, the so-called dum-dum bullets are lighter in weight and can be fired with greater accuracy over varying distances. "These bullets more or less exploded inside the body. All the energy of the bullets was deposited inside the tissue," Dr. Colin Poole said. Police said the suspect claims he acted alone, despite the statements of some witnesses who said they believed there was a second gunman on the island. "What we've heard so far is that Breivik has been co-operative with police. In fact, he has been quite keen to tell his story," CBC's Nahlah Ayed said. A search of the suspect's home and his Facebook postings turned up suggestions of right-wing and anti-Muslim political leanings, said police. Police are examining the online tract published the day of the attack. The author talks of "training hard" and taking steroids and describes how to acquire chemicals and weapons. The author of the diatribe — entitled 2083: A European Declaration of Independence — vows that the European elite, "multiculturalists" and "enablers of Islamization" will be punished for their "treasonous acts." The tract advocates violence to defeat liberal immigration policies and preserve "European Christendom." Police have not confirmed their suspect wrote the document, but the online document attributed to Breivik contains images of him. According to the Norwegian Broadcasting Corporation, the suspect spent the past nine years writing the document. Lippestad said his client wrote the document alone. But parts of it were taken almost word for word from the writings of "Unabomber" Ted Kaczynski, who is serving a life sentence for mail bombs that killed three people and injured 23 others across the U.S. from the 1970s to the 1990s. The passages copied by Breivik appear in the first few pages of Kaczynski's manifesto. Breivik changed a Kaczynski screed on leftism and what he considered to be leftists' "feelings of inferiority" mainly by substituting the words "multiculturalism" or "cultural Marxism" for "leftism." Breivik did not cite Kaczynski. 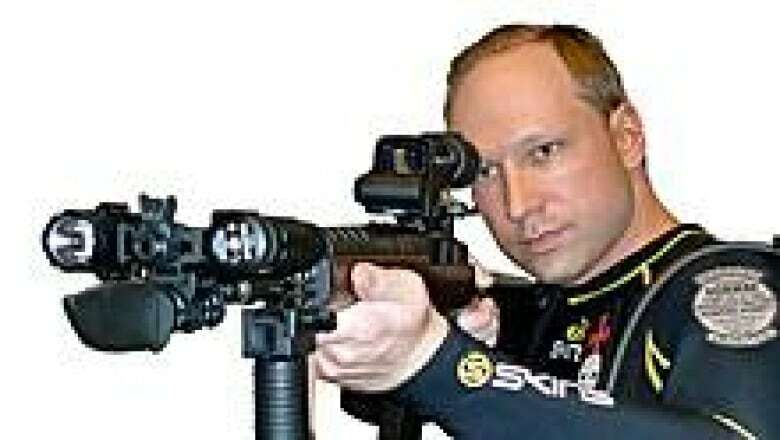 Anders Behring Breivik is shown in an online document attributed to him that was discovered the day after Friday's shooting and bomb attack in Norway. (Scanpix/Associated Press)As the investigation continued, hundreds gathered in downtown Oslo for a memorial church service in the Norwegian capital to remember the victims. 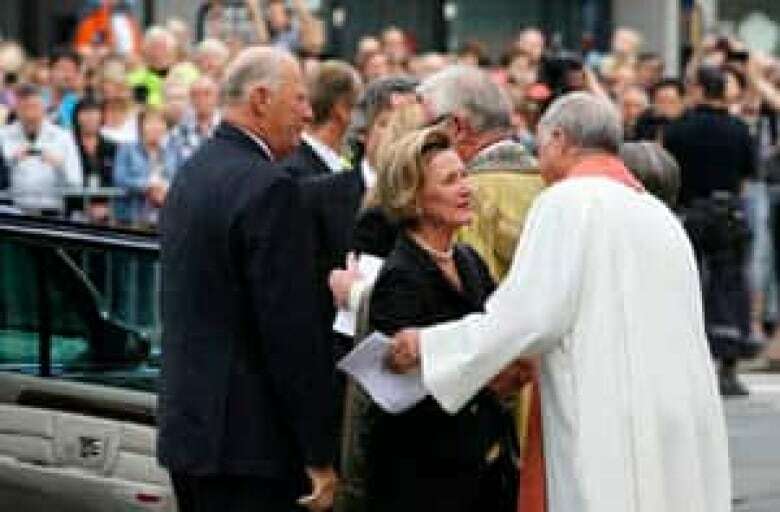 Norwegian King Harald V and his wife Queen Sonja were among mourners who attended the service at Oslo Cathedral. A constant line of mourners came to lay flowers and candles over vast areas of the plaza outside the cathedral, the CBC's Ayed reported. All the pews in the church were packed, and people were even standing at the back and outside, huddling under umbrellas in the rain. 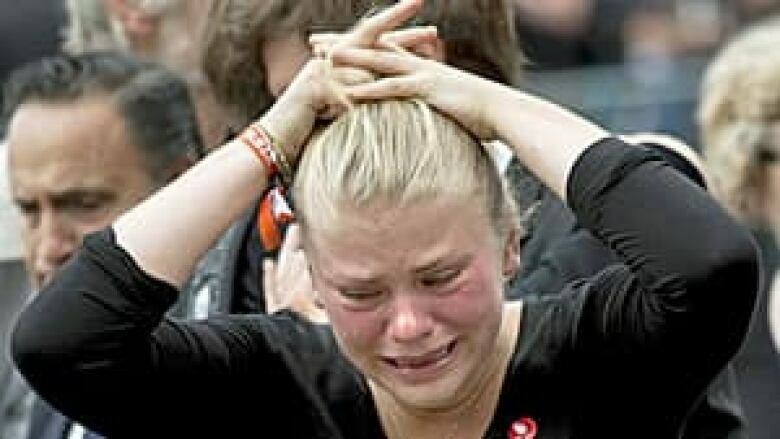 The king and queen wiped away tears as Norwegian Prime Minister Jens Stoltenberg delivered an emotional speech. "Every single one of those we have lost is a tragedy in itself. Together, it is a national tragedy," Stoltenberg said. Norway's shooter: Delusional loner or far-right conspirator? POV: Should the Norway gunman's court appearance be open to the media?